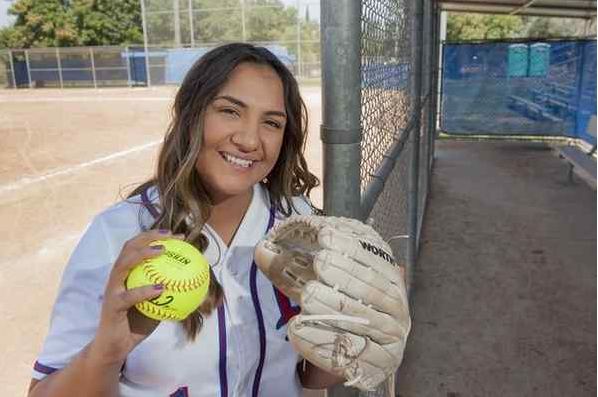 Los Altos high school was the area’s biggest surprise of the 2017 softball season and it came with the emergence of junior pitcher Savannah Diederich, who dominated in the circle and carried a big stick for the Conquerors. Diederich, a junior who is verbally committed to the University of Mississippi, struggled along with the Conquerors just a year ago, finishing 11-13-1 and third in the Hacienda. Amazing what a year of work will do. Diederich was dominant this season, finishing 22-7 with a 1.40 ERA and 219 strikeouts while leading the Conquerors to an undefeated Hacienda League title run and 24-7 overall record. Diederich also performed well in the CIF Southern Section Division 3 playoffs, leading the Conquerors to the quarterfinals before losing a pitching duel to Ayala, 1-0. What made Diederich even more threatening is what she did with a bat in her hands, hitting .437 with three homers, 10 doubles and 24 RBIs to earn Hacienda League player of the year honors. For her efforts, Diederich has been named the Tribune’s 2017 softball player of the year. 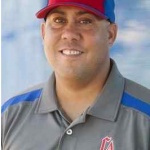 Joining Diederich with top honors is Los Altos coach Lydell McCullough, who was named the Tribune’s coach of the year. McCullough had coached previously with Los Altos, but after Los Altos struggled to a losing season a year ago, it brought McCullough back and he quickly restored the tradition with a league title and quarterfinal playoff run. Joining Diederich and McCullough on the Tribune first team are 16 standouts led by a deep arsenal of four pitchers. South Hills’ Natalie Lugo, a three-time Tribune player of the year and headed to the University of Florida in the fall, was strong in the circle again, but didn’t have the defensive help as years past. She put up her usual solid numbers, finishing 9-9 with a 1.43 ERA with an area-leading 233 strikeouts in 144 innings. St. Lucy’s Dakota Casper helped carry the Regents to the Division 2 semifinals, throwing a gem in a 4-0 quarterfinal victory over Villa Park before losing a heartbreaker in the semifinals to Camarillo, 1-0. Casper, the Baseline League MVP, finished 19-6 with a 2.29 ERA while also batting .275 with three home runs. Glendora junior pitcher Noemi Flores was named the Palomares League MVP after leading the Tartans to the league title, finishing 11-4 with a 2.50 ERA. Charter Oak senior pitcher EmaRae Flores rounds out the first team of pitchers. She was solid all season, finishing 18-5 with a 2.26 ERA and leading the Chargers to the Division 2 quarterfinals. Two underclass catchers were named to the first team, St. Lucy’s sophomore Audrey Sellers and Charter Oak junior Jantzen Owen. Both were not just extremely solid defensively, they also brought a lot of offensive firepower. Sellers, a Baseline first-team selection, batted .476 with nine home runs, 10 doubles and 32 RBIs. Jantzen, a Hacienda league first teamer, batted .377 with six home runs, four doubles and 38 RBIs. Seven infielders landed on the first team, which included two super sophomores in Wilson’s Janelle Meono and South El Monte’s Chasity Martinez. Meono, a University of Arizona commit and Valle Vista first-teamer, helped lead the Wildcats to the Division 6 semifinals, batting a ridiculous .667 with eight triples, five doubles and three home runs. Martinez led the Eagles to the Mission Valley League title and was league MVP. She led the Eagles to the Division 5 quarterfinals, batting .451 with four homers, nine doubles and 37 RBIS. Bishop Amat featured two infielders on the first team with senior shortstop Gabby Bracamonte and third baseman Madeline Ramirez, who were both named to the Del Rey first team. Bracamonte batted .400 with five doubles and two triples while Ramirez hit. 419 with three home runs, six doubles and 17 RBIs. Los Altos junior Kelly Monroy, Glendora’s Amanda Woods and St. Lucy’s Samantha Garcia also were named first team infielders. Woods, a Palomares first-teamer, batted .357 with 20 RBIs and Garcia, a Baseline first-teamer, batted a whopping .543 with seven home runs and 24 RBIs. Monroy, a shortstop, was named to the Hacienda first team after batting .500 with 10 doubles and 22 RBIs. Three outfielders made the first team, which included Glendora sophomore Chloe Bahruth, Los Altos’ Melissa Felix and San Dimas senior Brooke Jackson. Jackson, also the Valle Vista League MVP, batted a team best .455 with seven home runs and 26 RBIs. Bahruth, named to the Palomares first team, batted .325 with a team-best 30 RBIs. Felix, a junior named to the Hacienda first team, batted .443 with 18 RBIs. Player of the year: Savannah Diederich, Los Altos, Jr.
Pitcher: Natalie Lugo, South Hills, Sr.
Pitcher: EmaRae Flores, Charter Oak, Sr.
Pitcher: Dakota Casper, St. Lucy’s, Sr.
Pitcher: Noemi Flores, Glendora, Jr.
Catcher: Jantzen Owen, Charter Oak, Jr.
Catcher: Audrey Sellers, St. Lucy’s, So. Infield: Janelle Meono, Wilson, So. Infield: Kelly Monroy, Los Altos, Jr.
Infield: Samantha Garcia, St. Lucy’s, Jr.
Infield: Madeline Ramirez, Bishop Amat, Sr.
Infield: Amanda Woods, Glendora, Sr.
Infield: Gabby Bracamonte, Bishop Amat, Sr.
Infield: Chasity Martinez, South El Monte, So. Outfield: Chloe Bahruth, Glendora, So. Outfield: Melissa Felix, Los Altos, Jr.
Outfield: Brooke Jackson, San Dimas, Sr.
Pitcher: Kennedy Cuevas, Edgewood, Jr.
Pitcher: Destinee Lopez, Bonita, Sr.
Catcher:: Clareese Santiago, Glendora, So. Catcher: Giselle Bahena, Bishop Amat, Sr.
Utility: Andrea Wood, Los Altos, Sr.
Utility: Nevaeh Castruita, South El Monte, So. Infield: Shynia Torrez, Arroyo, Sr.
Infield: Mia Ayala, Wilson, Fr. Infield: Taylor Tetone, Glendora, Sr.
Infield: Camyl Armendariz, Bonita, Fr. Infield: Karissa Duran, Bishop Amat, Sr.
Outfield: Morgan Salgado, Charter Oak, Fr. Outfield: Clarissa Reynoso, San Dimas, Jr.
Outfield: Ruth Munoz, Diamond Bar, Sr.
Outfield: Katie Greep, St. Lucy’s, Jr.
Outfield: Alyssa Avalos, St. Lucy’s, Sr. There were plenty of amazing seasons for East San Gabriel Valley baseball players, but it was hard to match the total package of Nogales High School pitcher and catcher Jonathan Guardado, who helped lead the Nobles to the CIF Southern Section divisional semifinals for the first time since 1978. Guardado pitched the Nobles to the semifinals, throwing a two-hitter in a 3-1 quarterfinal victory over Capistrano Valley in the Division 4 playoffs, but the Nobles fell in the semifinal game, spoiling a chance for Guardado to possibly lead the Nobles in a championship final. When Guardado wasn’t pitching he was catching for the 27-3 Nobles, and also led the team in several offensive categories, batting. .488 with 36 RBIs and 13 doubles. For his efforts, Guardado has been named the Tribune’s 2017 player of the year. Guardado also was named the Montview League player of the year, and was selected to USA Today’s High School All-American second team. 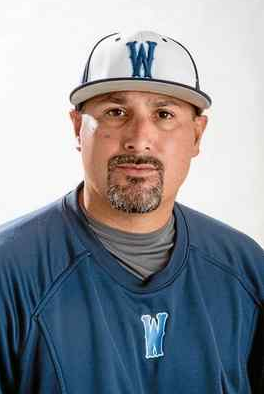 Walnut coach Paul Acosta led the Mustangs to the divisional championship game for the second time in three years, and this time the Mustangs sealed the deal, defeating Righetti 13-2 to claim the Division 3 championship to give the Mustangs their first title since 1982. 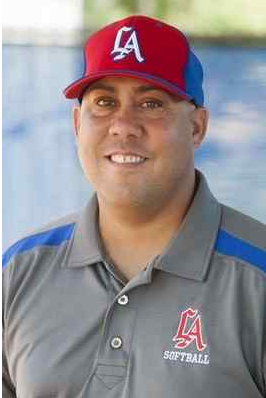 Acosta, who won Tribune coach of the year honors in 2015 after knocking off previously undefeated and USA Today’s number one San Dimas in the CIF semifinals, has been named the coach of the year for 2017, giving him top honors in two of the last three years. Walnut also won the Hacienda League and finished 25-9. The 2017 Tribune first team was loaded with 15 standouts, led by five amazing pitchers. 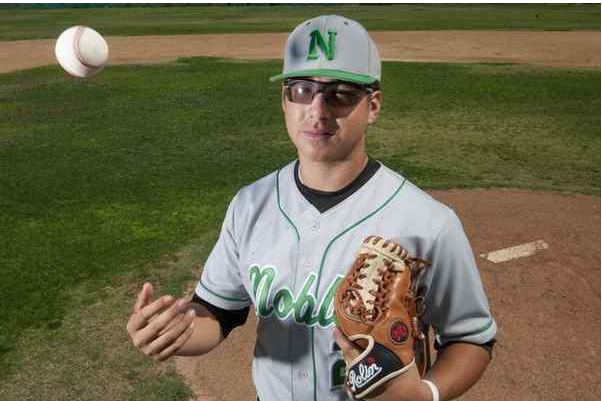 South Hills junior Brandon Dieter, who won player of the year in 2016 after leading the Huskies to the Division 2 title, had another amazing season, earning Palomares League co-most valuable player honors while dominating on the mound and at the plate. Dieter finished 9-2 with a 0.85 ERA while also hitting .355 with 17 RBIs and seven doubles. Glendora’s Hayden Pearce was equally impressive for the Tartans and shared Palomares MVP honors with Dieter. Pearce finished 9-2 with a 1.24 ERA and batted .333 with 10 RBIs while helping the Tartans to the Division 2 quarterfinals. Bishop Amat pitcher Isaac Esqueda was named the Del Rey League pitcher of the year and helped the Lancers win the league title and advance to the second round of the Division 1 playoffs. Esqueda finished 6-3 with a 1.01 ERA while also belting five doubles and homer. 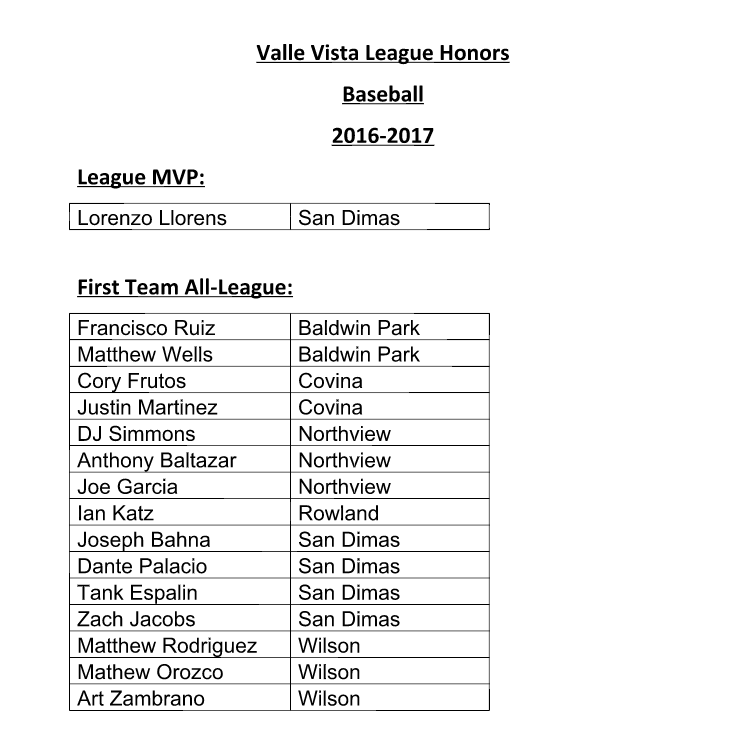 San Dimas’ Lorenzo Llorens also was named to the first team after leading the Saints to the Valle Vista league title and earning league MVP honors. Llorens was 9-2 with a 1.33 ERA while also hitting .434 with 24 RBIs. Walnut’s Brandon Godoy, only a junior, was named the Hacienda League MVP while also leading his team to the Division 3 championship. Godoy finished 11-1 with a 1.57 ERA while also batting .355 with 18 RBIs. Godoy’s teammate, senior Andre Alvarez, was the lone catcher named to the first team after earning Hacienda first-team honors while batting. 417 with 24 RBIs and three home runs for the CIF champions. The first team included six infielders, which featured South Hills senior Jacob Amaya, a Cal State Fullerton commit who was selected by the Los Angeles Dodgers in the 11th round of Major League Baseball’s draft last week. Amaya, a shortstop, was a Palomares first team selection for the fourth straight season, batting. .323 with 15 RBIs and three homers. Bishop Amat shortstop and Vanderbilt-bound Jayson Gonzalez was named MVP of the Del Rey League and deservedly so after hitting . 375 with five homers, four doubles, three triples and 14 RBIs in helping the Lancers to the Division 1 second round. Nogales shortstop and Montview first-teamer Steven Ordorica had the highest batting average on the first team, batting a whopping .517 with 19 RBIs and seven doubles. Glendora junior shortstop Bryce Wooldridge, named to the Palomares first team, batted .383 with 21 RBIs and 14 doubles. And Damien third baseman Harrison Spohn, a Baseline first-teamer, batted .379 with seven doubles and three triples. Charter Oak infielder Dino Miranda rounds out the first team infielders. He was selected to the Hacienda first team, batting .431 with 18 RBIs and nine doubles. 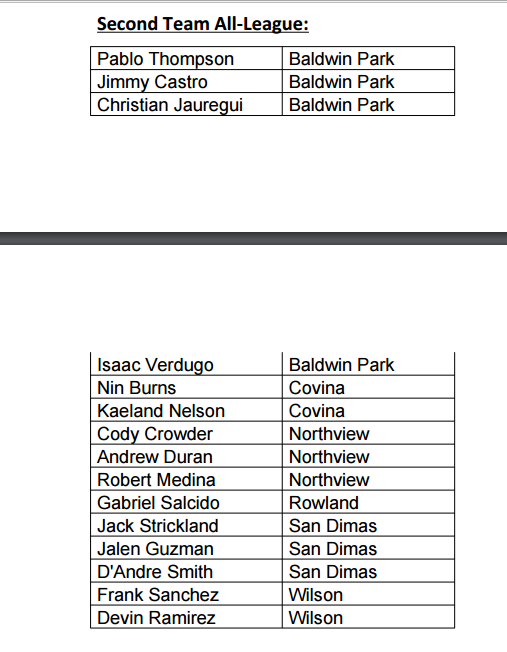 There were three outfields named to the first team, which includes Damien’s Isaiah Paige, South Hills’ Karlos Morales and San Dimas’ Dante Palacio, who all made first team all league. Paige batted .313 with 14 RBIs while Morales hit .291 with 13 RBIs, three doubles and two triples. Palacio batted. .372 with 24 RBIs and nine doubles. Player of the year: Jonathan Guardado, Nogales, Sr.
Pitcher: Isaac Esqueda, Bishop Amat, Sr.
Pitcher: Brandon Dieter, South Hills, Jr.
Pitcher: Brandon Godoy, Walnut, Sr.
Pitcher: Haydon Pierce, Glendora, Sr.
Pitcher: Lorenzo Llorens, San Dimas, Sr.
Catcher: Andre Alvarez, Walnut, Sr.
Infield: Steven Ordorica, Nogales, Sr.
Infield: Bryce Wooldridge, Glendora, Jr.
Infield: Harrison Spohn, Damien, Sr.
Infield: Jacob Amaya, South Hills, Sr.
Infield: Jayson Gonzalez, Bishop Amat, Sr.
Infield: Dino Miranda, Charter Oak, Sr.
Outfield: Karlos Morales, South Hills, Sr.
Outfield: Isaiah Paige, Damien, Sr.
Outfielder: Dante Palacios, San Dimas, Sr.
Pitcher: Matt Rodriguez, Wilson, Sr.
Pitcher: Julian Rodriguez, Charter Oak, Sr.
Pitcher: Elias Jauregui, Pomona, Jr.
Pitcher: Mario Huizar, Sierra Vista, Jr.
Catcher: Jesus Maldonado, Bishop Amat, Sr.
Catcher: Daniel Genna, South Hills, Jr.
Catcher: Jarrett Lindsay, Bonita, Sr.
Infield: Arty Zambrano, Wilson, Sr.
Infield: Joseph Bahna, San Dimas, Sr.
Infield: Andy Rodriguez, Walnut, Sr.
Infield: Jacob Gonzalez, Glendora, Fr. Infield: Julian Valera, El Monte, Sr.
Outfield: Jacob Garcia, Walnut, Sr.
Outfield: Michael Landeros, Nogales, Jr.
Outfield: Dylan Zavala, Walnut, Sr.
Bonita baseball coach Samuel Lopez told his players Thursday that he is resigning after one year on the job, school officials confirmed. Lopez took over for longtime coach John Knott, who had built Bonita into a powerhouse and won a CIF title in 2012. Lopez guided the Bearcats to a 15-11 overall record, but the Bearcats, accustomed to making deep playoff runs, failed to reach the Division 1 playoffs. Lopez had left Carter High for Bonita after a successfull five-year tenure, compiling a 98-40 record, making the playoffs in all five years, and winning a league title three times. Sources said Lopez left to take another job closer to home. Also, senior-to-be Tommy Delgado, an infielder, transferred to South Hills. Delgado was injured for part of the season, but as a sophomore, he had a monster year, batting. 388 with five homers and 33 RBIs. 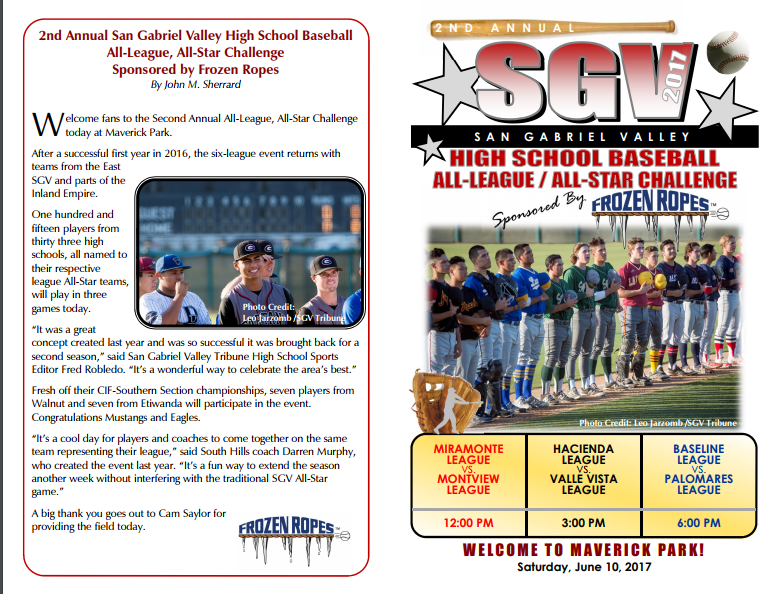 The second annual San Gabriel Valley Frozen Ropes league vs. league all-star tripleheader is Saturday at Maverick Park in West Covina. The first of three games will be the Miramonte League taking on the Montview League at noon, followed by the Hacienda vs. Valle Vista at 3 p.m., and concluding with the Palomares against the Baseline at 6 p.m. The all-star teams consist of players that were selected to the all-league first teams, with some second-team selections added to to the rosters. It’s not a senior game, it’s an all-star game of all levels that received sparkling reviews when the event was put together last year. “The feedback regarding the league versus league all-star games has been great,” said event organizer and South Hills coach Darren Murphy. “Word got around enough that Frozen Ropes (of Glendora) asked to be part of it this year as a sponsor which is awesome. One hundred fifteen players from 33 schools will play in the seven-inning games throughout the day. 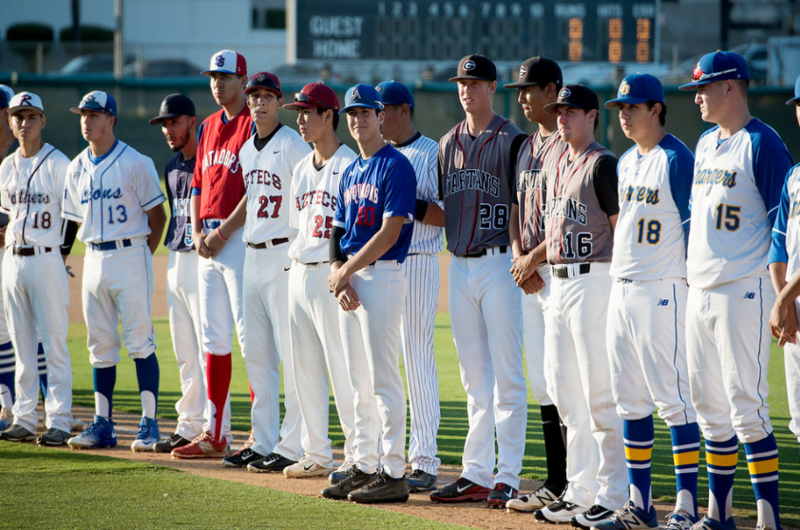 Two of the six teams will feature players that just won CIF-Southern Section championships. Walnut, which won its second CIF title in school history last weekened, and Etiwanda, which also won a divisional title, will be part of the Hacienda and Baseline leagues respectively. 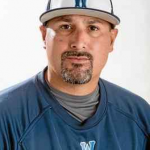 “I was fortunate to coach last year and very blessed to coach again this year,” said Walnut coach Paul Acosta. “This all-star game is different and unique and the best are here to represent the league. Head coaches will invite coaches from other teams in their league and Acosta cherishes that moment. 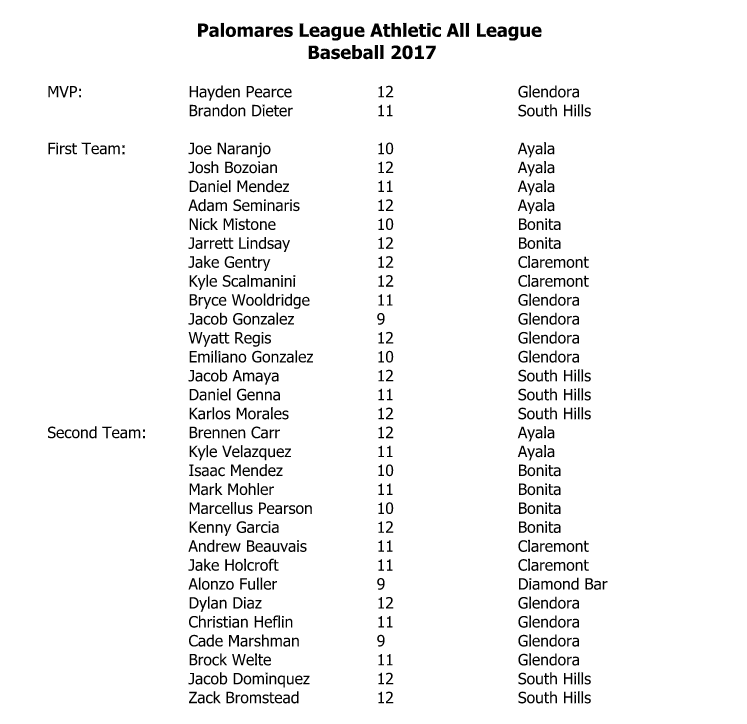 All of the league MVPs are scheduled to play, including Co-MVPs in the Palomares League, senior Hayden Pearce (Glendora) and junior Brandon Dieter of South Hills. 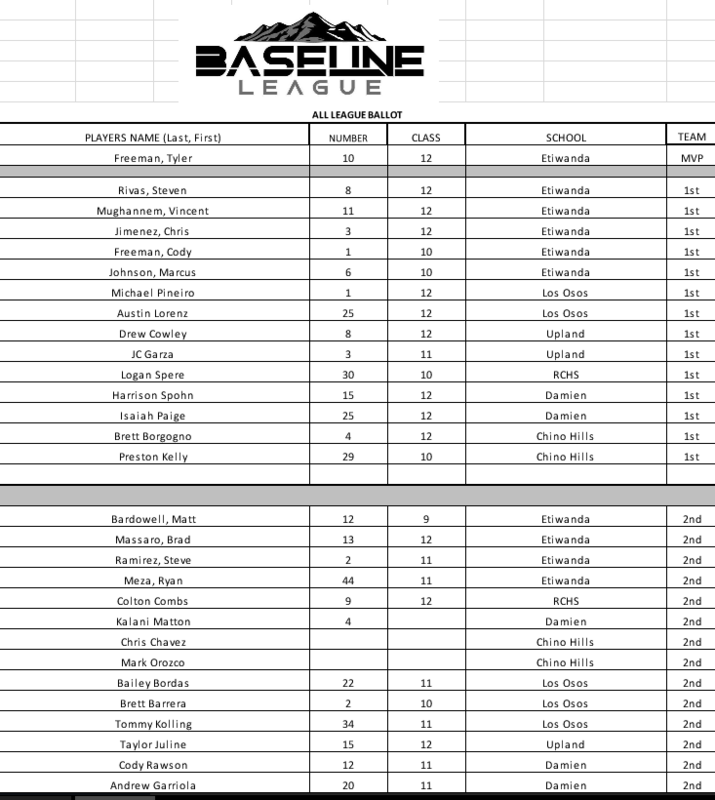 The Palomares League opponent, the Baseline League, will have senior MVP Tyler Freeman of Etiwanda. Senior Lorenzo Llorens of San Dimas (Valle Vista League) and senior Brandon Godoy of Walnut (Hacienda) will face each other. 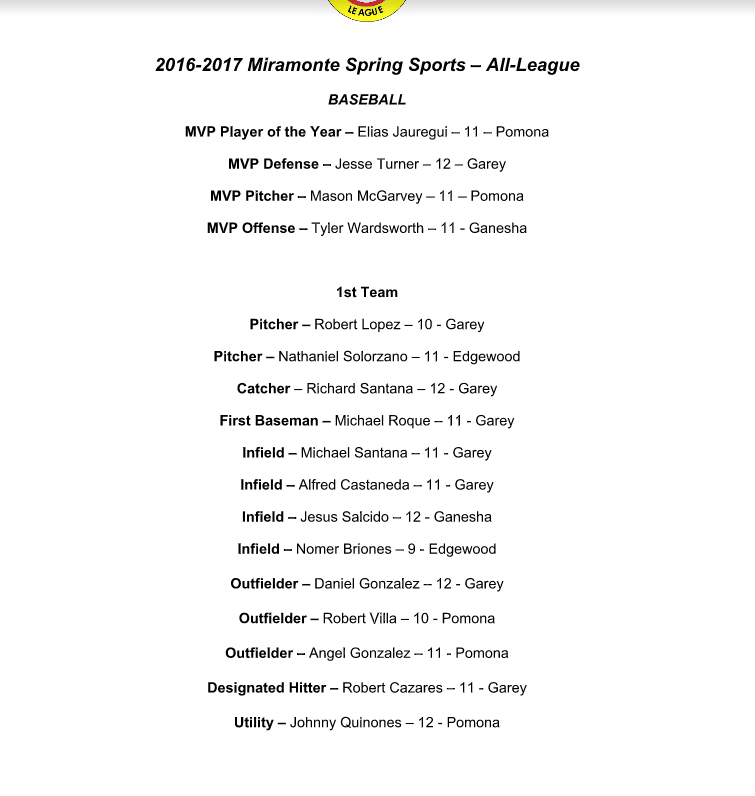 Elias Jauregui (Pomona) and Jonathan Guardado (Nogales) will represent the Miramonte and Montview leagues respectively as their MVPs. Honorary head coaches for each league goes to the team that wins the league title, which awards them for their success. 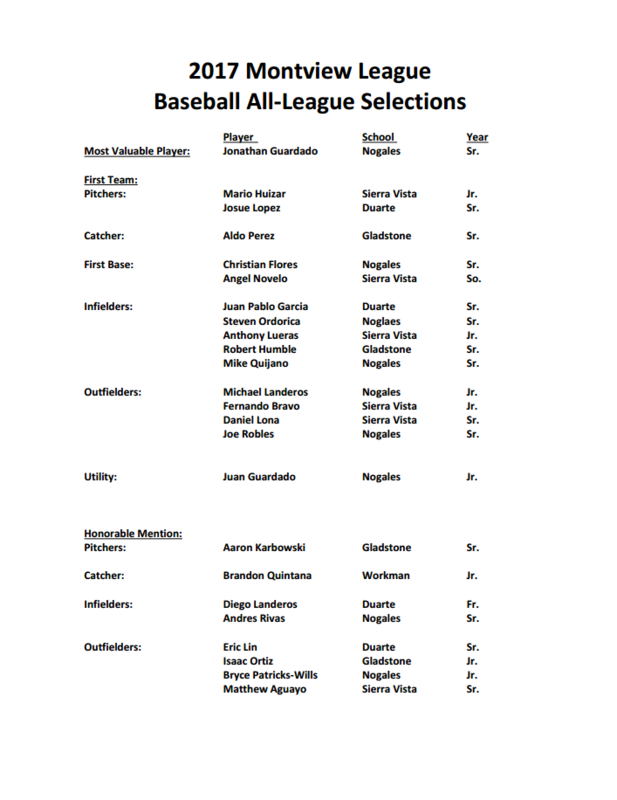 Coaches chosen will be from the respective league champions, which includes Jesse Mendez of Pomona and Ruben Amancio of Garey from the Miramonte League; Donnie Montanez of Nogales in the Montivew League; Acosta of Walnut from the Hacienda League; Mike Regan and Mark Chiappelli of San Dimas in the Valle Vista League; and Darren Murphy of South Hills and Dan Henley of Glendora of the Palomares League. Donald Furnald of Etiwanda will coach the Baseline league. The Frozen Ropes league vs. league all-star games at Maverick Park in West Covina will close out the high school season with a triple header. It was a great concept created last year and was so successful it was brought back for a second season. 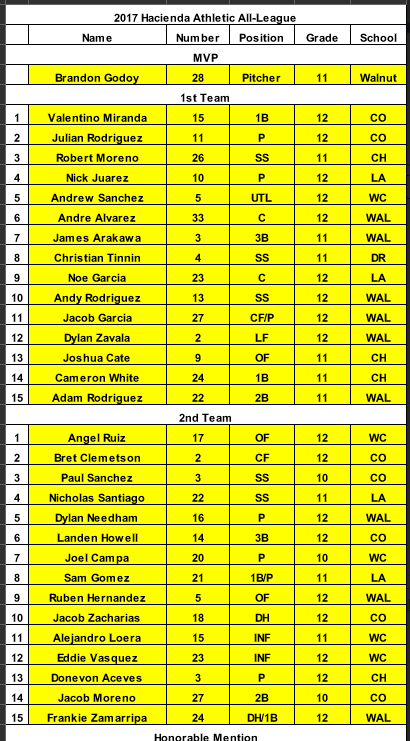 Basically, rosters are made up from first team all-league selections with some second team and honorable mentions added if needed to fill out the rosters. Hacienda vs. Valle Vista, 3 p.m.
Palomares vs. Baseline, 6 p.m.
We just learned of the tragic news that La Serna High school senior and football player Jeremy St. Julian died on Tuesday, a day before La Serna’s graduation tonight. Here is a statement from the school to administrators. Will update. It is with great sadness that I inform you that yesterday evening, Jeremy St. Julian, a senior at La Serna died in a tragic hiking accident. We are all very heartbroken over this tragedy and loss. We are all dealing with this loss at the same time we are preparing for graduation and celebration of achievement. We want to help you to process this loss and the complex emotions you may have at this time. Most of the 52 seniors from 30 San Gabriel Valley high schools played in their last game before a packed house in the 22nd Annual San Gabriel Valley All Star event at Mt. San Antonio College on Monday night. The Red team, with six runs in the first inning, cruised to an 11-1 victory over the Blue team at Mazmanian Field. The Red team, with the help of two errors, two walks, and a two-run single by Arcadia’s John Woo, scored six runs in the first seven batters of the game. They would add three more runs in the third for a 9-0 lead. Jesus Maldonado of Bishop Amat led off with the biggest hit of the night — a stand-up triple to right. He scored on a single by Woo. Woo, who received the Most Valuable Hitter award, scored on an RBI double by Damien’s Kalani Matton. Maranatha’s Eddie Lopez followed with a sacrifice to center field to score Woo for a 3-0 lead. Woo had two hits in the game, along with three RBIs. Matton also had two hits, which included a double and an RBI. The unique aspect of the San Gabriel Valley All Star Softball game is that it allows underclassmen to showcase their skills. Area fans got a front row look at the next superstar in Los Altos junior pitcher Savannah Diederich. And she showed why she has committed verbally to the University of Mississippi. Diederich pitched a solid three innings, striking out four of the nine hitters she faced to help lead the South to a 10-6 win over the North on Sunday evening at Citrus College. Another underclassman that performed at a high level was Wilson’s Janelle Meono. The sophomore, who has given a verbal commitment to the University of Arizona, had two hits with an RBI. For her efforts, she was named the game’s Most Outstanding Player. The South scoring barrage started in the first inning when Bishop Amat’s Madeline Ramirez singled to score teammate Gabby Bracamonte for a 1-0 lead. Los Altos senior Andrea Wood, who will be attending Cal State San Marcos, promptly banged a line-drive double that scored Ramirez for a 2-0 lead. The South added four runs in the fifth inning. 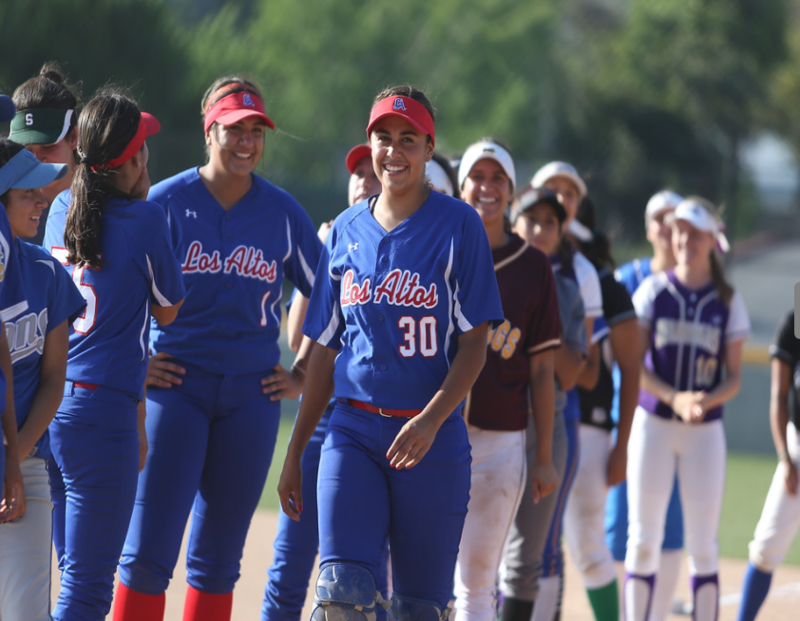 The key play of the inning was a line-drive double by Los Altos’ Melissa Felix off Charter Oak pitcher Emma Rae Flores that scored two runs. Charter Oak’s Bri Rubalcava got the North on the scoreboard in the seventh inning when she brought in Arroyo’s Shania Torres with a single. Torres also brought in two more runs in the eighth inning on a double to cut the South lead to 10-4. The North made the game very interesting in the ninth inning. It started when Glendora sophomore Chloe Bahruth connected on a two-run homer off West Covina pitcher Trinity Garcia to cut the South lead to 10-6. The North loaded the bases with two outs. Garcia then secured the win by striking out San Dimas’ Brooke Fuss.